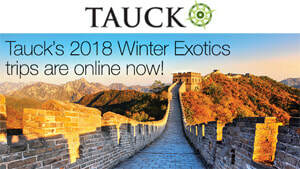 Tauck's 2018 Winter Exotics - Fugazi Travel Agency Inc. If you've been dreaming about taking a once-in-a-lifetime bucket list trip with one of the world's best travel companies, we’re delighted to let you know that all the details of Tauck's 2018 Winter Exotics adventures are online and ready to book right now. Tauck's Exotics trips explore some of the most exciting destinations around the world... mysterious Machu Picchu, picturesque Patagonia, intriguing Marrakech, the Japanese Alps, the Galápagos Islands, Tanzanian game reserves, and Kathmandu, giving you the opportunity to discover them up-close and in-depth with trusted experts who ensure your peace of mind every step of the way. TAUCK 2018 WINTER EXOTICS ARE AVAILABLE NOW! When you go someplace exotic with Tauck, you'll enjoy the signature peace of mind that Tauck has brought to every trip since 1925. Tauck's all-inclusive pricing eliminates foreign currency challenges. Tauck Exclusive experiences foster new cultural connections. And their signature do-it-for-you services ensure worry-free travel in far-off places to make your travel experience everything you dreamed it would be! Take a look at a few of the journeys you can take with Tauck below; then check out all of their 2018 Winter Exotics trips at tauck.com. Crafted by Tauck and Ken Burns – The world’s first national park inspires awe any time of the year, as Yellowstone winter tours would attest. But as you’ll discover on this very special 8-day Culturious trip, visiting the national park during the winter – when bison, elk, wolves and bighorn sheep wander across snow-covered valleys, and Yellowstone's amazing geologic features are even more spectacular in the frigid air – is a whole other... and perhaps other-worldly... experience. Exploring by snowcoach, you'll see gurgling mud pots and steaming hot springs surrounded by frozen landscapes... waterfalls whose cataracts partially freeze into ice bridges... and geysers, like iconic Old Faithful, erupting dramatically into the cold winter air. And you'll meet a noted naturalist and wildlife photographer who offers insights into the lives of the park’s iconic species. ​Our 12-day South Africa tours go beyond the ordinary with amazing travel experiences that include game drives in two of the most sought-after private game reserves – stay in the heart of the reserves, where you just might spot leopards, lions, elephants, impalas, and zebras. Attend wine tastings, special presentations and lectures with local experts... and experience the vast legacy of cultural and natural history in Cape Town, Robben Island, Johannesburg, and Soweto. Learn more about the struggle against apartheid, travel up Table Mountain for extraordinary views of "the end of the continent," and meet some elephants during your two-night stay at Victoria Falls – a highlight of our South Africa tours. Earth Journeys, created by Tauck and BBC Earth... featuring Santa Cruz II! Join us on this Earth Journeys family travel experience, featuring custom-made film vignettes by BBC Earth natural history experts and, when the opportunity arises, the use of field equipment. Pack your bathing suits, sunscreen, hats and comfortable hiking shoes and prepare to get wet as you set sail for some of the most amazing tropical islands in the world on Tauck Bridges' family Galápagos tour that features a four-night cruise aboard the new expedition ship Santa Cruz II. A treasure trove of unique creatures live above and below the ocean's surface – and with the aid of Go Pro cameras and FLIR® thermal imaging cameras you might be able to view some of their antics. Have you ever seen birds wearing bright red or blue "shoes"? Earth Journeys, created with BBC Earth... Floating castles of ice glisten in the warmth of the austral sun... glacial mountains rise from the sea, framed against a radiant sky... in an instant, a bright sun illuminates a floating regatta of ice formations... Explorers throughout the centuries have been captivated by the ice... Today, you are that Antarctic explorer. Few experiences can compare to the feeling you'll have as you head off on an expeditionary Antarctica cruise and immerse in the Earth Journeys experience, featuring custom-made BBC Earth on-tour film vignettes and, when the opportunity arises, the use of field equipment. Your adventure begins with two nights in amazing Buenos Aires, Argentina. Then it's all aboard Le Boréal or Le Soléal for a 10-night cruise to a magical wonderland where the locals, from penguins and seals to seabirds, welcome you ashore with friendly curiosity.